Clothing acts to protect you against weather wind and helps you regulate body warmth. Here are a few hints on how to select clothing that will keep you warm and dry as well as comfortable on a tour. Mountain weather in Norway is unpredictable. It can be warm and pleasant, with sunshine from a cloudless sky. Moments later, it can be grey and gloomy, with pouring rain and cold mist. Weather conditions vary so much that the best mountain clothing is the same year-round, summer and winter. In summer, you can experience full winter weather, with snow flurries and temperatures below freezing, and in winter you sometimes can ski in shorts. Regardless of the season, clothing must be able to transport moisture away from your body. Consider the weather, wind and temperature and your level of activity, and clothe yourself accordingly, in layers: first a layer of underwear, then one or more intermediate layers and, finally, an outer layer. Multiple layers of clothing enable you to regulate warmth and protection by putting on or taking off garments. Experiment a bit, and find what suits you best. Test your clothing at different temperatures and levels of activity, but always take along spare clothing on a tour. The innermost layer should keep the skin dry and provide insulation. Choose wool or synthetic garments that fit snugly. A wool garment can absorb an amount of moisture equivalent to 30 % of its weight yet retain its insulation. Wool underwear smells much less than synthetic underwear and accordingly may be a good choice whenever you wear the same garment for many days. Avoid cotton underwear, which absorbs and holds moisture, making cotton garments cold and clammy. Cotton garments insulate poorly when moist, so you can quickly chill when wearing them. The intermediate garments provide insulation and transport moisture away from the body. They may be made of wool or fleece, but the same rule applies as for underwear: wool absorbs moisture and gains weight, but insulates well even when wet. Fleece materials insulate and transport moisture well and also dry rapidly. Try different garments to see which suits you best. In any case, you should choose intermediate garments to suit temperature and your level of activity. For instance, for moderate activity, you may need an intermediate garment, but for a high level of activity, you may need no intermediate garment. Nonetheless, for ski touring in the mountains, you should take along a spare wool sweater in your pack. The outer garments provide wind protection yet let excess body warmth and moisture escape. Water repellency is an additional advantage. Windproof garments of cotton are often comfortable and let moisture escape, but are not waterproof. Garments with a membrane, such as Gore-Tex® are both windproof and water repellent and allow moisture to escape from the body, but easily can be clammy in winter. It will transport moisture better than a garment with a synthetic membrane and consequently feels warmer. As you move along, you should regulate warmth for comfort and to avoid being sweaty or cold. Your neck, your wrists and your head give off heat, so you can regulate body warmth by using a collar, wrist bands and a cap to regulate the amount of heat escaping. Under the arms of jacks and along the legs of wind trousers there often are vents that can be opened and closed as needed. Ventilate well when you are active, and put on extra clothing when you stop. Always take a cap, regardless of the season. Body warmth rises, and much of it is lost through the scalp. So a cap helps you stay warm. It should be of a material that doesn't hold moisture. The best caps are knitted of wool or wool-synthetic blends or windpoof caps. If your jacket doesn't have a hood, you can wear a windproof cap. Even in summer, it's wise to take mittens along, to keep your hands warm and dry. In winter two layers are best, one for warmth and one for water repellency and wind protection. Particularly in winter, you should have windproof outer mittens. They should be large enough to permit your wearing thick wool mittens under them, and should have cuffs that extend a ways up your arm, under the arms of your jacket. Remember that mittens are warmer than gloves, because the fingers are kept together and warm each other. Your feet are most exposed to cooling, so you should think first of keeping them dry and well broken in, because dry feet are less likely to become chilled. The multiple layer principle also applies to footwear. Air trapped between the outer material and the lining of a boot provides insulation. 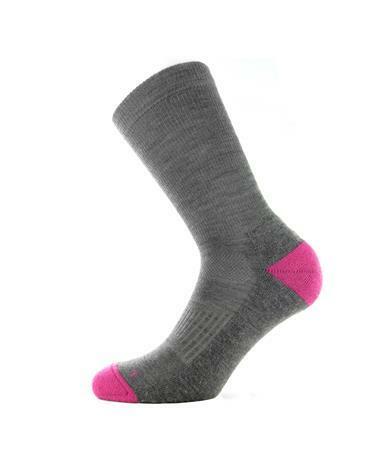 Wear socks of wool or wool-synthetic blend or other materials that insulate and transport moisture away from the feet. On longer tours, you can wear two pairs of socks, to reduce friction and avoid chafing. In summer, you can wear two thin rather than one thick pair of socks.